The year is 1947, and the war isn’t over. For anyone waiting until the dust settled before getting into Dust Tactics, it’s been a confusing ride over the last few years. First there was the original ‘big box’ Dust Tactics (with normal and premium pre-painted versions); then Fantasy Flight revised the core set into a smaller box and called it the Revised edition. Then a tabletop version called Dust Warfare was released. Finally, the licence was passed to Battlefront Miniatures, and here we are with Dust Tactics Second Edition (or sometimes, Dust Tactics 2.0). The confusion doesn’t end there though. 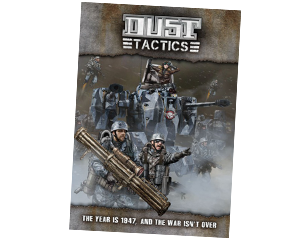 Dust Warfare seems to be floating in limbo while this new version of Dust Tactics is a 112-page rulebook that includes both the original ‘boardgame’ rules, plus a very similar version designed for the tabletop called Dust Tactics Battlefield. I only played Warfare once, and while it had its own charms, I definitely think it was a smart move to make the tabletop version almost the same as the boardgame version. Now you have one set of cards (for gamers there at the start like me, this is the second time I’ll be replacing my unit cards) and pretty much one set of rules. Even better, the myriad special rules and abilities are virtually the same. Things were far more confusing when we had two different rules systems. Kudos to Battlefront for simplifying matters, though I’m relieved I only ever forked out for the PDF versions of the Warfare rules. I’m not as satisfied with the new dice. The original dice had a wonderful simplicity to them—just hit or blank sides—that was iconic for the game, and now results vary between three symbols (one of which changes depending on the faction-themed dice you use). I just find it hard to get used to the faction symbol—rather than the hit symbol—being a hit in most circumstances. I’m sure I’ll get used to it eventually and no doubt the increased flexibility was required, but it does seem a shame to lose something that made the game so distinctive. Here are rules summaries and reference sheets for both Dust Tactics and Dust Tactics Battlefront; despite the repetition I’ve kept these separate so you can use the right sheets for the right game. To avoid confusion! Thanks for doing the v2 Summary. Although the rules have been streamlined again it’s always beneficial to have a good summary. There is ABSOLUTELY NO NEED for the new dice. Initiative can be rerolled as long no one wins and for Missions and Stimulants I use D6. It really works out great and keeps the dice simplicity of v1. Any chance you’ll be picking up the 1947 Rules? Not sure, but possibly not. I’ve spent a lot of time and money on Dust, and I’m tired with the constant edition changes – especially the unit card changes, when they do silly things like not show an image of the unit on the weapon side of the card. I’ll probably stick with the Battlefront edition. Anyone have suggestions for infantry movement trays that would fit both the bases of the models and the terrain grids? I tried looking around online, but i’m not even sure if the infantry bases are 28mm or 30mm from a casual search. Thanks in advance! You really don’t need to bother, you can pick up a unit with your fingers and move it, or push the figures, with ease. But FYI, the bases are 30mm in diameter. I was thinking easier identification of squads from my Plano box as more figures arrive, but I suppose color coded dabs of paint on the bottom of the base is the cheaper and more efficient solution. I make it a habit to write the names of figures on the underside of the bases – not as useful during the game itself, but very handy for keeping everything organised. Another good idea. Also, I meant underside of base as well- I wouldn’t desecrate the surprising very nice Premium paint jobs! I spent a small fortune years ago having locals paint my standard figs, and these look SO much better.